This document presents information that will help font developers create or support OpenType fonts for the Telugu script covered by the Unicode Standard. The Telugu script is used to write the Telugu language of Andhra Pradesh, India, as well as the minority languages Gondi and Lambadi. This document targets developers implementing Indic shaping behavior compatible with Microsoft OpenType specification for Indic scripts. It contains information about terminology, font features and behavior of the Indic shaping engine in regards to the Telugu script. 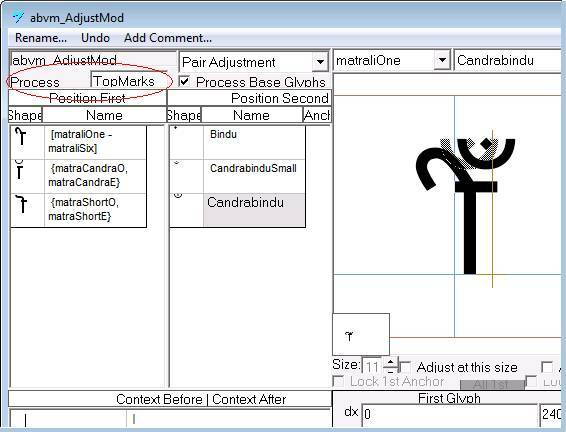 While it does not contain instructions for creating Telugu fonts, it will help font developers understand how the Indic shaping engine processes Indic text. In addition, registered features of the Telugu script are defined and illustrated with examples. In the example below using the Devanagari script, (Ra + halant + Da+ halant + Ma + I-matra), Ra + halant will form the reph, but how the Da is classified will determine the position of the reph as well as the location of the pre-pended matra. 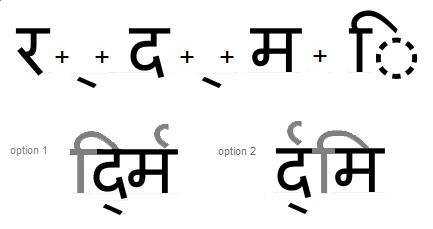 Option 1: While the Da does not have a true half form in Devanagari, it can be listed in the ‘half’ feature lookup substituting the ‘halant form’ of Da. Thus, the shaping engine will treat it as a half form and the reph will be positioned on the first main consonant; and the I-matra will be positioned immediately in front of the “half-form” D(a). 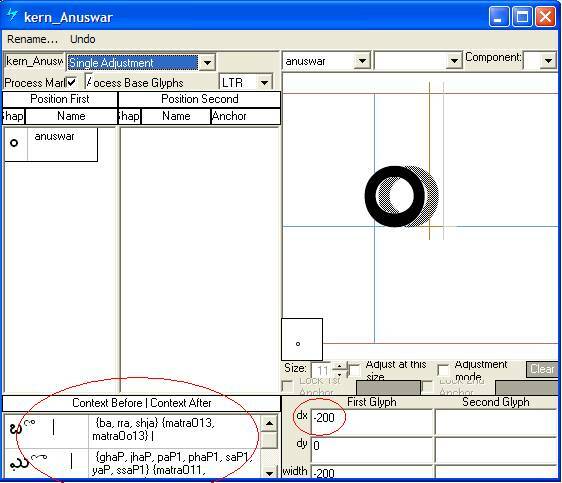 Option 2: By not listing Da in the ‘half’ feature lookup, the halant form will display and the shaping engine will treat it as the first main consonant on which to position the reph. And the I-matra will be positioned immediately in front of the base (or half-form) preceding it, which in this case is the Ma. Above-base form of consonants – A variant form of a consonant that appears above the base glyph. Akhand ligatures - Required consonant ligatures that may appear anywhere in the syllable, and may or may not involve the base glyph. Akhand ligatures have the highest priority and are formed first; some languages include them in their alphabets. Base glyph - The only consonant or consonant conjunct in the orthographic syllable that is written in its "full" (nominal) form. In Devanagari, the last consonant of the syllable (except for syllables ending with letter "Ra") usually forms the base glyph. In "degenerate" syllables that have no vowel (last letter of a word), the last consonant in halant form serves as the base consonant and is mapped as the base glyph. Layout operations are defined in terms of a base glyph, not a base character, since the base can often be a ligature. Below-base form of consonants - A variant form of a consonant that appears below the base glyph. In Devanagari, only the consonant Ra has a below-base form. In the glyph sequence, the below-base form comes after the consonant(s) that form the base glyph. Below-base forms are represented by a non-spacing mark glyph. Cluster – A group of characters that form an integral unit in Indic scripts, often times a syllable. Consonant conjuncts (aka “conjuncts”) - Ligatures of two or more consonants. Consonant conjuncts may have both full and half forms, or only full forms. Halant (Virama) - The character used after a consonant to "strip" it of it’s inherent vowel. A Halant follows all but the last consonant in every Telugu syllable. Halant form of consonants - The form produced by adding the Virama to the nominal shape. The Halant form is used in syllables that have no vowel or as the half form when no distinct shape for the half form exists. Half form of consonants (pre-base form) - A variant form of consonants which appear to the left of the base consonant, if they do not participate in a ligature. Consonants in their half form precede the ones forming the base glyph. Some Indic scripts, like Devanagari have distinctly shaped half forms for most of the consonants. If not distinct shape exists, the full form will display with an explicit Virama (same shape as the halant form). OpenType layout engine – Library responsible for executing OpenType layout features in a font. In the Microsoft text formatting stack, it is named OTLS (OpenType layout services). OpenType tag – 4-byte identifier for script, language system or feature in the font. Post-base form of consonants – A variant form of a consonant that appears to the right of the base glyph. A consonant that takes a post-base form is preceded by the consonant(s) forming the base glyph plus a halant (virama). Post-base forms are usually spacing glyphs. Reph – The above-base form of the letter "Ra" that is used in Devanagari when "Ra" is the first consonant in the syllable and is not the base consonant. Shaping Engine – Code responsible for shaping input, classified to a particular script. Telugu syllable - Effective orthographic "unit" of Telugu writing systems, consisting of a consonant and a vowel core, and optionally preceded by one or more consonants. Syllables are composed of consonant letters, independent vowels, and dependant vowels. In a text sequence, these characters are stored in phonetic order (although they may not be represented in phonetic order when displayed). Once a syllable is shaped, it is indivisible. The cursor cannot be positioned within the syllable. Transformations discussed in this document do not cross syllable boundaries. Vattu - A below-base form of a consonant. In Devanagari, "Ra" can take a vattu form within a cluster; this "Vattu-Ra" is also known as Rakaar. The descriptions which follow will help font developers understand the rationale for the Telugu feature encoding model and help application developers better understand how layout clients can divide responsibilities with operating system functions. Reorder matras: If a pre-base matra character had been reordered before applying basic features, the glyph can be moved closer to the main consonant based on whether half-forms had been formed. Actual position for the matra is defined as 'after last standalone halant glyph, after initial matra position and before the main consonant'. If ZWJ or ZWNJ follow this halant, position is moved after it. Apply feature 'akhn' to substitute required akhand ligatures, or to substitute forms that take precedence over forms produced by features applied later. 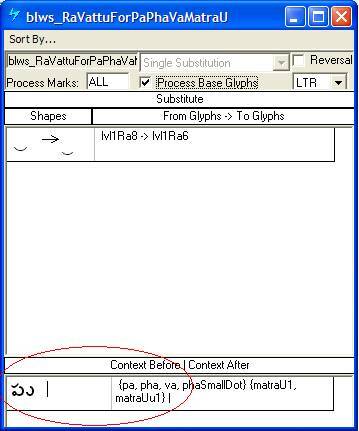 Apply feature 'rphf' to substitute the reph glyph (above-base form of 'Ra'). Apply feature 'pref' to substitute pre-base forms. Apply feature 'blwf' to substitute below-base forms. Apply feature 'pstf' to substitute post-base forms. Apply feature 'cjct' to substitute conjunct forms. (This is needed particularly for ligature conjuct forms when the pre-base consonant does not have a half form). 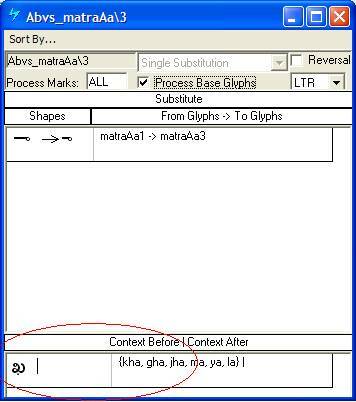 Apply feature 'abvs' to substitute above-base matra conjuncts; reph conjuncts; above-base vowel modifiers; and above-base stress and tone marks. Apply feature 'blws' to substitute below-base consonant conjuncts; below-base matra conjuncts; below-base vowel modifier forms; and below-base stress and tone mark forms. The shaping engine next processes the GPOS (glyph positioning) table, applying features concerned with positioning. The font developer must consider the effects of re-ordering when creating the GPOS feature tables. The shaping engine next processes the GPOS (glyph positioning) table, applying features concerned with positioning. All features are applied simultaneously to the entire cluster. Apply feature 'abvm' to position above-base marks (above-base consonant forms, matras, vowel modifiers or stress/tone marks) on base glyphs or post-base matra). Apply feature 'blwm' to position below-base marks (below-base consonant forms, matras, vowel modifiers or stress/tone marks) on base glyphs or post-base matra). Commonly, a feature is required for dealing with the base glyph and one of the post-base, pre-base, above-base or below-base elements. Since it is not possible to reorder ALL of these elements next to the base glyph, we need to skip over the elements "in the middle" (reordering-wise). Generally, it is good practice to label as "mark" any glyphs that are denoted as combining marks in the Unicode Standard as well as below-base/above-base forms of consonants. Then, different attachment classes should be assigned to different marks depending on their position with respect to the base. For example, after the shaping engine has re-ordered elements within the cluster, matras will always occur before syllable modifier sign such as the candrabindu. In an actual sequence, though, potentially some other mark glyph, such as nukta, may occur between the matra and the candrabindu. Thus, when processing the matra and candrabindu, you may need to allow for the possibility that some other mark glyph(s) may occur between them. Using lookup flags, you can specify that a lookup should process only a certain class of marks, such as 'above-base marks', and ignore all other marks. In that way, a match will occur whether or not a mark from another class is present. Otherwise, the lookup would fail to apply. To allow for shaping engine implementations that expect to position an invalid mark on a dotted circle, it is recommended that a Telugu OT font contain a glyph for the dotted circle character, U+25CC. If this character is not supported in the font, such implementations will display invalid signs on the missing glyph shape (white box). In addition to the 'dotted circle' other Unicode code points that are recommended for inclusion in any Telugu font are the ZWJ (zero width non-joiner; U+200C), the ZWNJ (zero width joiner; U+200D) and the ZWSP (zero width space; U+200B). For more information see the Suggested glyphs section of the OpenType Font Development document. In the illustration below the I-matra is displayed without the dotted circle by using the NBSP. The combination of NBSP and ZWJ is used to display the below-base form of Ka in isolation. The features listed below have been defined to create the basic forms for the languages that are supported on Telugu systems. Regardless of the model an application chooses for supporting layout of complex scripts, the shaping engine requires a fixed order for executing features within a run of text to consistently obtain the proper basic form. Many of the registered features described and illustrated in this document are based on the Microsoft OpenType font Gautami. 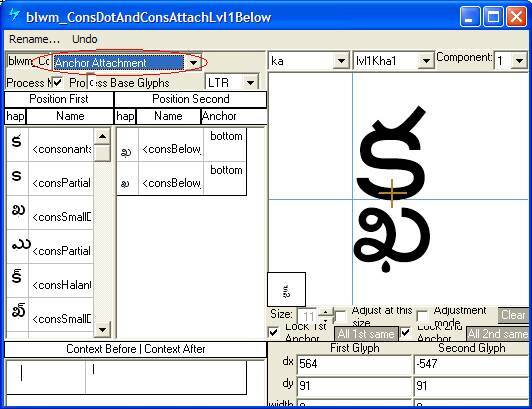 'Gautami' contains layout information and glyphs to support all of the required features for the Telugu script and language systems supported. This feature is used in association with OpenType language system tags to trigger lookups that will select alternate glyphs needed for language-specific typographic conventions. The 'locl' should not be used in association with the default language system, but only used with other language system tags. See the Appendix of this document for language system tags associated with the Telugu script. This feature substitutes the below-base forms of Consonants that follow the base consonant. If a ligature is required between the below-base glyph and the preceding consonant, it will be handled by the feature 'Below base substitutions' (blws). Applying this feature substitutes half forms - forms of consonants used in the pre-base position. Consonants that have a half form should be listed in the 'half' feature. Some scripts, like Devanagari have distinctly shaped half forms for most of the consonants however, if a consonant does not have a distinct shape for the half form and does not form any ligature, it will be displayed with an explicit Virama (same shape as the halant form). 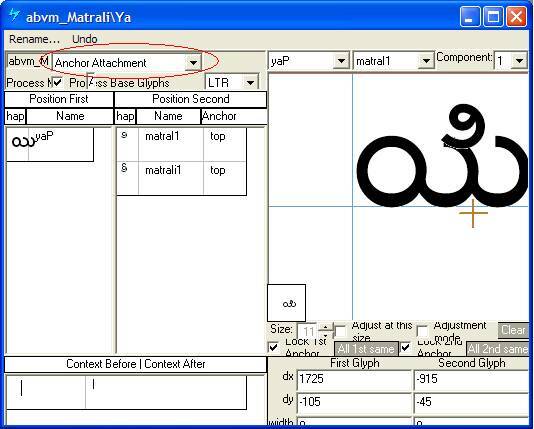 Note - While Telugu typically does not use half forms, this feature is made available for typographic preference. The 'pstf' feature can be applied to substitute the post-base form of a consonant. This feature is used to substitute pre-base consonant conjuncts made with half forms, the type most common in Devanagari. The resulting conjunct can be in full or half form. This feature can also be used to select variant forms of Matras, or pre-composed ligatures of Matras with certain bases. 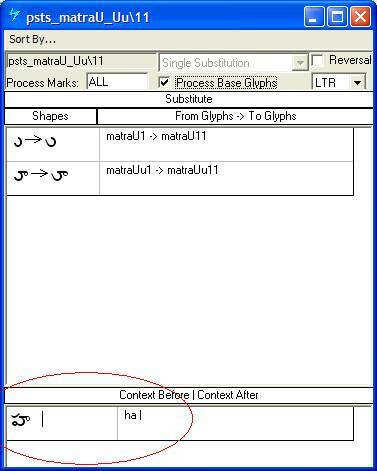 This feature is used for glyph substitutions involving above-base marks. Such substitutions might be used to select contextual forms of marks, to create mark-mark ligatures, or to create mark-base ligatures. Specific context-dependent forms or below-base consonants are handled by this lookup as well. This feature is used to substitute the halant form of a base (or conjunct base) glyph in syllables ending with a halant. Halant forms can also be created by positioning the halant as a below-base mark on the base glyph using the 'blwm' positioning feature. This feature is applied only on the base glyph if the syllable ends with a halant. Unlike the previous presentation lookups, the 'calt' feature is optional and is used to substitute discretionary contextual alternates. It is important to note that an application may allow users to turn off this feature, therefore should not be used for any obligatory Telugu typography. Complex Telugu syllable formation is possible using the wide range of features available in OpenType. The following examples show how the shaping engine applies the OpenType features, one at a time to the input string. These combinations do not necessarily represent actual syllables or words, but are meant to illustrate the various OpenType features in a Telugu font. Features are encoded according to both a designated script and language system. The following table lists the registered tag names for script and language systems. Note for new Indic shaping implementation 'tel2' is used (old-behavior implementations used 'telu').